What if raptors could act just like a human? I think that they would like to rap from it’s name. 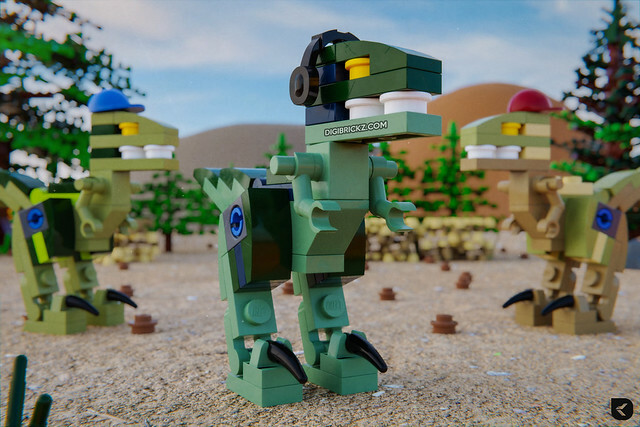 To realise that idea, I created a trio raptor models (Blue, Charlie, and Delta from Jurassic World movie) which is based from dimensions set (71205: Jurassic World Team Pack) model and completed with full LEGO desert-like scene, except for the mountains and ground. It looks like the raptors also following the modernization, look at those clean teeth and shiny claw! The raptors were also use headphone and caps to make it looks like real rapper from Jurassic era. It is actually my first most complicated render I’ve ever made, I also made bush, trees, rocks and added surface imperfections to the bricks. That’s why the memory consumption is large because of them. Effort won’t betray you, the result is no doubt, it’s like a photorealistic one for me. Related Posts of "Rapper Raptors"